Iron requirements also soar during pregnancy. Both the mother and the baby need it to build red blood cells. A pregnant woman’s blood supply increases by 1/3 over the course of the pregnancy. Babies must grow their entire blood supply from scratch – and scratch includes iron. It’s also a foundational building block of muscles and of a number of enzymes carrying out vital processes throughout the body. 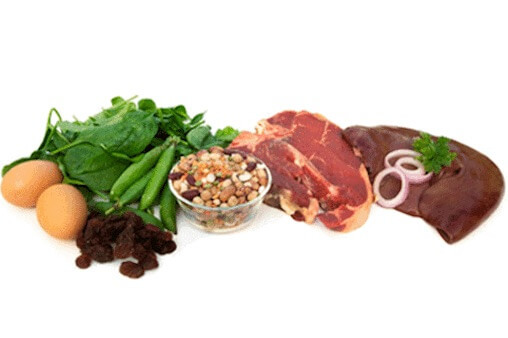 Iron occurs naturally in a number of foods. Good sources include organic fruits and vegetables such as raisins, apricots, prunes (and prune juice), spinach, kale, and other greens. We get it when we eat wonderful legumes such as dried beans, soybeans, peas, and lentils, and grains such as oatmeal. Especially rich sources include meat, fish, poultry, and eggs. Liver tops the list. Clearly pregnant women are designed to eat more of at least some of these foods. Perhaps it’s one reason why women lay awake dreaming of some of these foods (I can almost smell the juicy cheeseburger with sliced apricots). A savvy meal planner and smart cookware turn up the heat on getting enough of this important mineral. Eating or drinking foods high in vitamin C (such as orange juice) at the same time as foods high in iron helps the body to absorb and use it well. Cooking in iron pans can also add it to foods. Many foods, especially cereal grains, are now iron-fortified. It’s poorly absorbed from these sources, but manufacturers have dumped in enough to make up for this. In addition, prenatal vitamins contain plenty of iron. Pregnant women need about 27 mg of iron per day to supply themselves and their babies. A healthy baby born at term should have a store of about 500 mg of it in her body, all of it a gift from her parents.